Heat a large frying pan. Cut the guanciale into chunky strips of about 1cm thick and add them to the pan with the whole chilli. Fry over medium heat for about 2–3 minutes, or until the guanciale becomes dark and crunchy and the fat has melted. Turn off the heat. Remove the guanciale using a slotted spoon and drain on paper towel. Discard the chilli, but leave the leftover fat in the frying pan. Bring a large saucepan of salted water to the boil. Add the pasta and cook for the time indicated on the packet. Meanwhile, add the olive oil to the leftover guanciale fat, then add the tomatoes. Season with salt and freshly ground black pepper, and cook over low heat for 10 minutes. Once the pasta is al dente, drain and add to the sauce, along with the cooked guanciale. Mix everything together, then turn off the heat and stir the pecorino and parmigiano through. Serve with an extra sprinkling of cheese. The tomato-based amatriciana is a Roman favourite, although its origins lie in the Lazio town of Amatrice, hence the name. 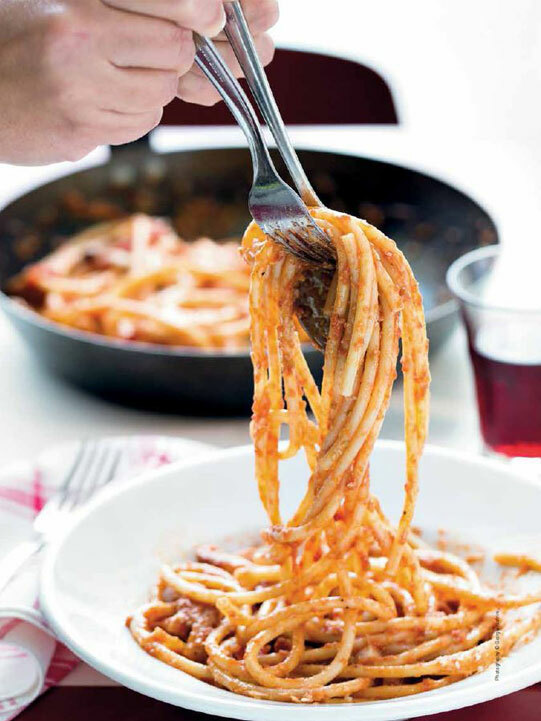 In Rome, unlike what might be served up outside of Italy, amatriciana is made with pecorino cheese, tomato, and guanciale (cured pork cheek). My friend Eleonora is a seventh-generation Roman (in Rome, you aren’t considered Roman unless your bloodline dates back at least seven generations! 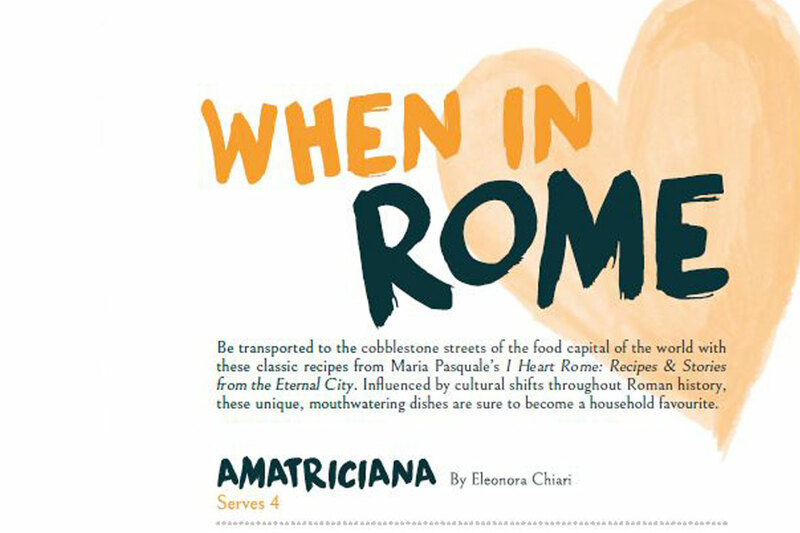 ), and her amatriciana is to die for, yet she defies tradition by adding some Parmigiano-Reggiano and a hint of chilli. You can stick with her version or play around with the recipe to make it your own. Serve it with either rigatoni, mezze maniche or bucatini pasta. Bring a large saucepan of salted water to the boil. Cut the broccoli into florets and cook for about 10 minutes, until just tender. Meanwhile, heat the olive oil in a frying pan, add the garlic and chilli and gently cook over low heat for 2–3 minutes to infuse the oil, taking care not to burn the garlic. Add the anchovies and continue to cook until they dissolve in the oil. Drain the broccoli and add to the pan, stirring well. Cook together for 5 minutes, or until the broccoli is soft and coated with the infused oil. Serve warm. 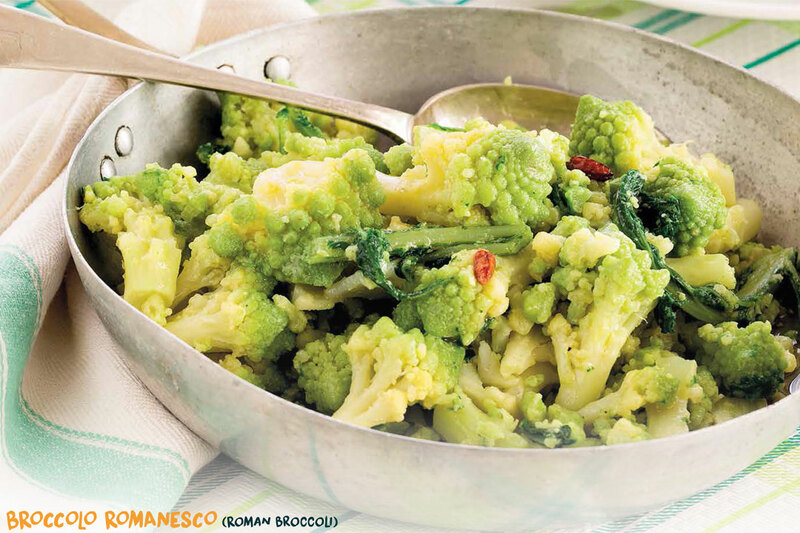 Roman-style broccoli is bright green and almost cauliflower-looking. 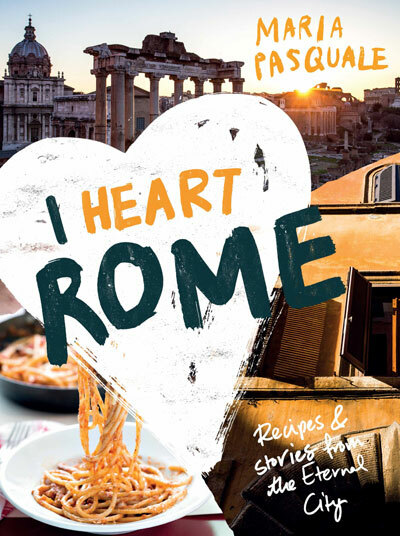 With this popular Roman side dish, Angelo says you could also use it as a base to create one of my favourite pasta dishes, pasta e broccoli – just toss your cooked pasta in the pan with a splash of olive oil or pasta water to give it a little sauce. This popular style of cooking vegetables works with many other vegetables and greens, such as regular broccoli, or cauliflower. Place the eggs and sugar into the bowl of an electric mixer and start beating at medium speed. Once the mixture turns pale yellow, add the mascarpone, set the speed to high and mix until the consistency turns thick and dense. 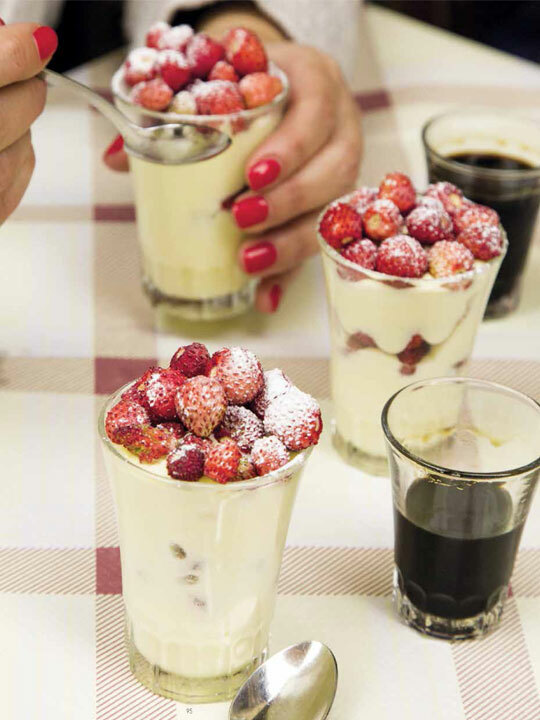 Spoon a few tablespoons of strawberries into each serving glass and cover with the mascarpone cream. Top with another spoonful of strawberries. Refrigerate for at least an hour, before serving with a sprinkling of icing sugar. The mascarpone mousse with fragoline di bosco (wild strawberries) at Da Enzo is my favourite dessert in Rome. It might be a big call, and it is. But it’s the truth. When I walk in and even before I sit down, I ask whoever’s working that day – whether it be the owners Francesco, Roberto, Maria Chiara or one of their cute waiters – to put one aside for me. They only make a set number each day, and I can’t face a meal here without knowing there’s a mousse waiting for me. They shared this divine recipe with me, and I hope it will sweeten your dinner parties for years to come. If you can’t source fragoline di bosco, regular strawberries will work fine, as will any other berry.